According to my sister, it’s not de rigueur to mess with classical Italian recipes. According to my stomach, it never hurts to bring down the calories while retaining superb taste. So goodbye classical risotto, hello Mushroom Quinoa Risotto — perfect, hot or cold. Two tubs of Costco mushrooms and a family reunion led to this wonderful dish. FYI, Costco has been accused of overpaying employees. Tsk-tsk. Heat oil in large skillet over medium-high heat. Add onion and shallot and sauté for about 5 minutes or until they begin to brown. Add garlic and cook for 30 seconds. 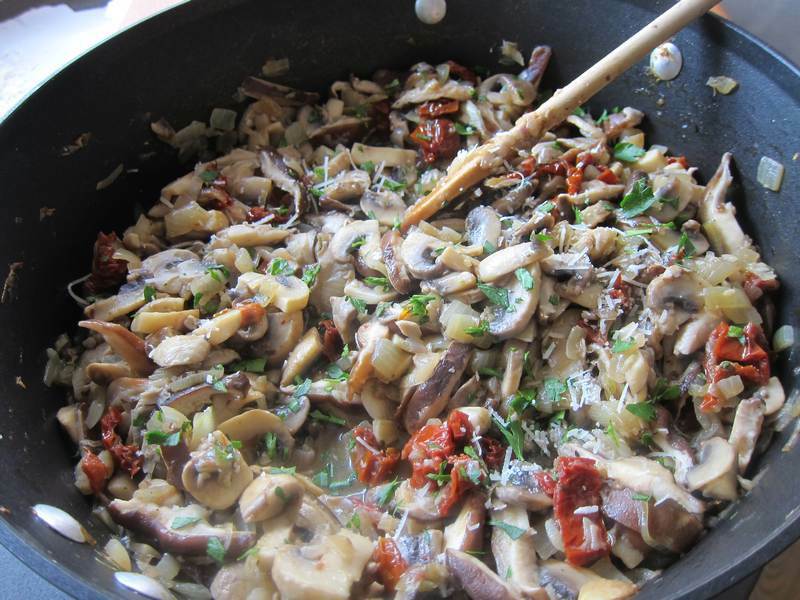 Add mushrooms and thyme, cooking for about 10 minutes or until mushrooms are tender. Add wine and cook for 3 minutes or until liquid thickens. Stir in sun-dried tomatoes. 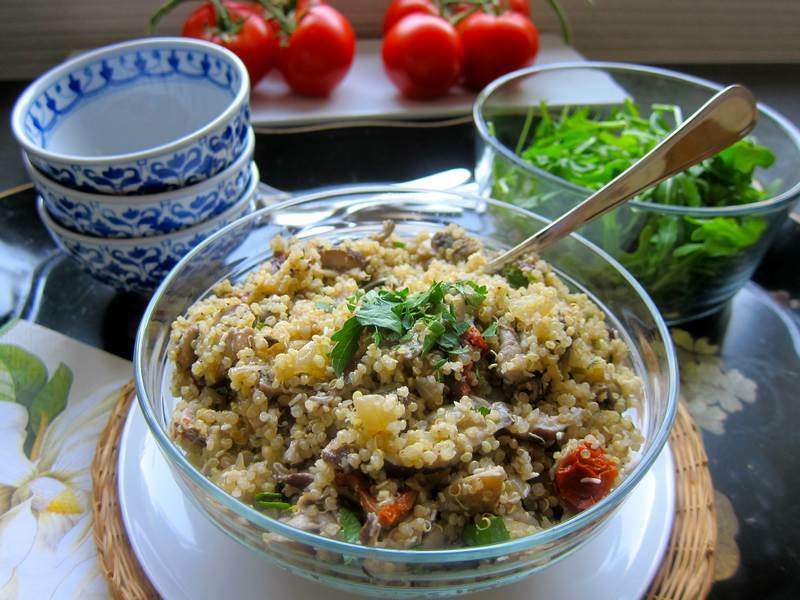 Combine quinoa with the mushroom mixture. Stir in 1/2 cup of Parmigiano-Reggiano. Season with salt and pepper. Garnish with parsley. Serve the remainder of the cheese on the side. Serves 10-12. 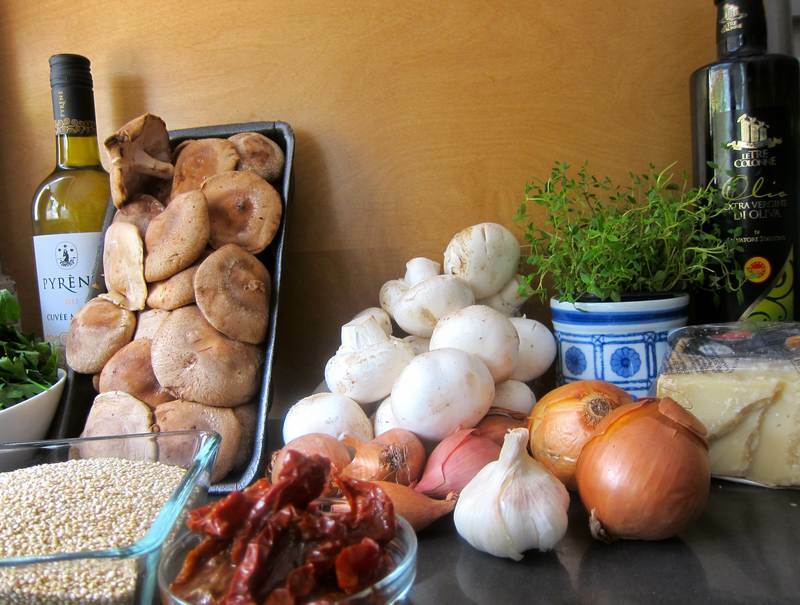 This recipe was based on the Epicurious Quinoa Risotto with Mushrooms and Thyme. If you think you don’t like quinoa, you’ll soon reconsider. It’s just because you haven’t had it cooked up nice and soft with wonderful wine, mushrooms, sun-dried tomatoes and Parmigiano-Reggiano. There is a Jittery Cook recipe highlighted in each monthly Shri Yoga newsletter. One more reason to love yoga! Glad you liked the concept. I’m sure you’ll like the faux risotto too. Thanks for linking my recipe to yours….I’m new to this so need all the help I can get….I’m now following you! Thanks Laurilee. I had the best farro dish at the wharf in SF. I need to experiment more with farro.